16 days, 8,000 miles and a lot of places later, I'm back home again. And it's a pretty good feeling. I think my last post left Josh and I in Colorado somewhere headed for CO Springs. We made it there, and Ben and Korlissa, old friends of his (and old acquaintances of mine) were awesome enough to let us stay with them for the weekend. It was definitely relaxing compared to the past week since we'd left Long Beach––but that's not to say we didn't do anything at all adventurous. 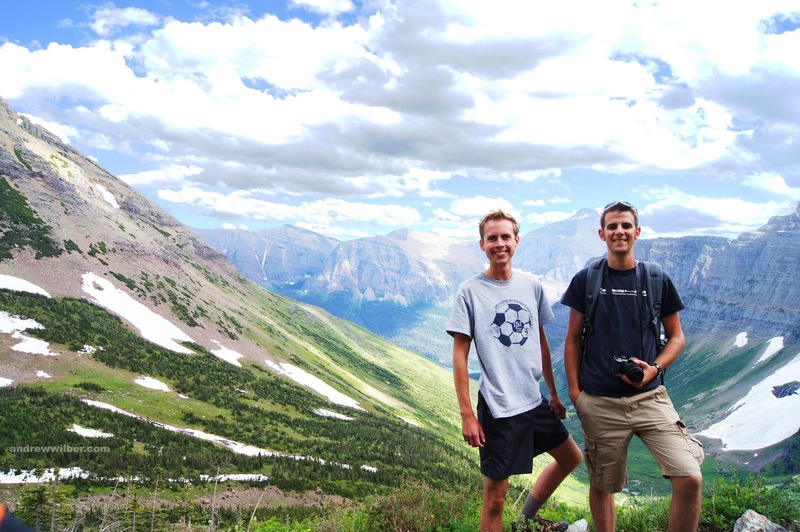 Sometime the week before, Ben had planted the idea in Josh's head that it would be a great idea to mountain bike down Pikes Peak. Not on the road, mind you. And by the evening we arrived at their house, the decision had already been made that it was to happen. I'm not a mountain biker, and even if I were, I wouldn't bike down pikes peak. 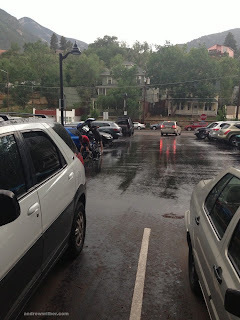 So it fell to me to drive my dare-devil friends to the top of the Mountain and then pick them up in Manitou Springs––where they apparently have flash-floods. Rain, however, was not expected until much later that afternoon, so we figured it would be okay. 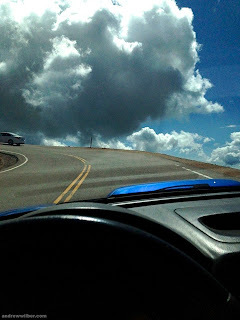 Ben and Korlissa had spent enough time the night before warning me how terrible the drive up and down Pikes Peak is that I think by the time I finally did it, it didn't seem too bad. So after arriving at the summit, eating some supposedly famous donuts that they make up there, jogging around to see how light-headed we could get at 14,110ft. altitude, Josh and Ben assembled their bikes and took off down the trail. And I got back in the car and headed for Manitou. On the way down, about everything that I'd been afraid might happen did happen––well almost anyways. Despite stopping a quarter of the way down to take a bunch of pictures, keeping the car in 2nd gear most of the time and only using the brakes on switch-backs, they were well over 300° by the mandatory brake check at the half way point, and they told me to stop for 15 minutes to let them cool. (I tend to think it's more a conspiracy than a safety measure as they have a large gift shop and cafe located right next to where they make you pull off). No sooner had I gotten back under way than it started raining, which meant there was only one real thought in my mind: Flash-floods. Particularly at the off ramp from 24 to Manitou where a reporter recently filmed himself and his car getting sucked into a torrent of muddy water. When I reached the off-ramp though, there was no wall of water in sight, and after a few minutes of driving around in search of a parking lot, I was sitting in this amazing little place called Kinfolks Mountain Shop waiting for my friends to show up on their bikes. That ended up being a bit, as they got hit by the same rain storm I did, only at their elevation, it was an ice storm. They made it though, and we went to a Palestinian restaurant called Heart of Jerusalem, where I had the best shawarma I've tasted since Beirut. So it all really ended well. We did some other cool stuff in CO Springs, and I must say my experience there far exceeded my expectations. Albeit, my expectations were formed mainly around the fact that it's the headquarters of Focus on the Family. But seriously, it was great. Two days later though, we were headed back into the midwest for a drive that seemed like it took forever. No, I don't remember how long it actually was. In fact I remember precious little about it, except that the welcome centers in Kansas have free coffee and tea. And then I was home, only I wasn't, because the next morning I had to go to Morris for two days to film a horse camp. And now that I'm done with that I'm extremely lazy and unmotivated. Thus the delay in publishing this post, and the complete lack of a unified voice throughout it. But, problems aside, that wraps up my experiences driving across the wild American West. Only not, because I just found out I'm driving to Texas in two weeks. I would not have been willing to mountain bike down the peak either! The only time I was there, someone had died hiking down Pikes that day and they kept explaining that didn't always happen, but still was a little freaky. I would have to be pretty experienced to be willing to bike down it. But anyway, I've loved reading the posts from the trip, and this made me miss CO a lot.